Arthur's Pass - Before you go Tramping - Equipment you NEED! Your pack should be large enough that most items should fit inside the main body of the pack, or be attached very firmly to the packs exterior. 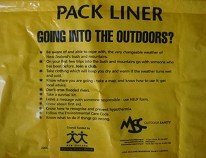 Items such as sleeping bags, and spare clothing should never be attached to the outside of the pack. Your pack should be lined with a heavy plastic Pack Liner, all sharp objects should be put inside something else (a pot) or wrapped in clothing to prevent damaging the liner. If your doing an easy or medium type tramp carrying the route description notes, and the Park Map should suffice, however on hard tramps you should be carrying the Route Guide (Click Here for current list), the appropriate Topographic Map (1:50,000) and a compass. Please note that compasses can be useless in certain areas of the Park because of interference by minerals in the ground (eg. Kelly Range), and should not be relied upon. 1x Emergency Blanket, Waterproof Plaster/s, Scissors, Paracetamol Tablets, Sterile Pads, a Wide Elastic Bandage, Suncream and Matches. 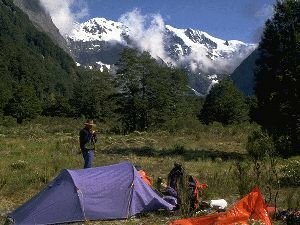 Always take a minimum of an extra full day's food for every three days tramping proposed. Arthur's Pass weather is so changeable that you may become trapped by flood-waters, or snow storms. Hopefully in one of the huts! If you will be spending some time outside of tree-line you should have at least 1 - 2 litres of drinking water available. Most of the streams, rivers and lakes in Arthur's Pass National Park are drinkable without any treatment required. Most of our huts come equipped with mattresses only. THERE ARE NO BLANKETS. Your sleeping bag should be temperature rated such that it can keep you warm down to 0ºC in summer (November - May), and -10ºC in Winter (June - October). Wet Weather Jacket of reasonable quality, with hood. Sturdy Footwear (Boots) LEAVE ON YOUR FEET FOR ALL RIVER CROSSINGS! Preferred clothing is made of synthetic or woollen material only, no cotton items (especially jeans). Gloves ,Spare Socks, Shirt, Trousers / Shorts, Thermal Clothing (polypropylene), Warm Jacket & Trousers. UV rated Sunglasses if your going to spend any time in or near snow, or there is any chance it may snow. Snow-blindness hurts! None of our huts are equipped with cooking stoves, or pots & pans, and the heating stoves provided in some huts are useless or inefficient for cooking on. Carry your own gas or liquid fuel stoves and cooking utensils into the hills. WARNING : Always use cookers in a well ventilated area, they create Carbon Monoxide gas that can kill you! Don't forget to take Matches, Candles, a Torch (flash-light), Water bottles, Sun-block cream, Toilet Paper, Notebook & Pencil.